Do You Know that you can search just the Directories by using the Directories button in the Partitioned search engine at the bottom of the Current What's New Page? Post Offices and Post Masters in Schuyler County. POST OFFICE TOWN. POST MASTER. Alpine Cayuta A. B. Rumsey. Beaver Dams Dix Almon Beecher. Cayutaville Hector Ebenezer M. W. Nye. East Orange Orange Benjamin Priest. Hector Hector Daniel G. Hunter. Mead’s Creek Orange Leander Chamberlin. Mecklenburgh Hector Mrs. Sarah M. McKinney. North Hector Hector T. H. Nichols. North Reading Reading Ebenezer Skinner. Perry City Hector John A. Potter. Pine Creek Orange John H. Rowley. Pine Grove Tyrone G. L. Pierson. Reading Reading John H. Nichols. Reading Center Reading Levi Shepherd. Reynoldsville Hector Geo. A. Soule. Searsburgh Hector David F. Sears. Seneca Hector Christopher C. Minor. Smith Valley Hector Hiram Faucett. Sugar Hill Orange Alonzo Robins. Townsend Dix Mrs. N. M. Hulett. Tyrone Tyrone E. R. Bissell. Watkins Dix Henry M. Hillerman. Post Offices and Post Masters in Chemung County. Big Flats Big Flats Wm. E. Tuttle. Chemung Center Chemung Frank Sayre. East Grove Veteran Jay McKinney. Elmira Elmira Wm. T. Post. Herrington’s Corners Erin A. R. Herrington. Horseheads Horseheads Chas. E. Thorn. Judsonville Southport James M. Edsall. Lowman Ashland Lyman L. Lowman. North Chemung Baldwin Paul Collson. Pine Valley Veteran Hiram M. Lattin. Post Creek Catlin W. G. Northrup. Seely Creek Southport F. M. Jones. Southport Southport Philetus P. Rathbun. State Road Erin G. M. Hollenbeck. Van Etten Van Etten J. Swartwood. Van Ettenville Van Etten D. B. Clarke. Wellsburgh Ashland Mrs. Lydia Salisbury. H. B. Holden, Practical Sign Painter and Designer, No. 154 Water St., Elmira, NY, publishes a card on page 162. It is with great pleasure that we introduce to the public Mr. H. B. Holden, who is prepared to execute all work in his line of painting and designing, entrusted to his care, in the most artistic manner. His lettering is unsurpassed and his designs for banners, curtains and badges, exhibit great care, skill and judgment. His Japan Tins, Gilding and Scroll Painting are models of taste and neatness. His Glass Tablet Signs, in gold and silver, are of the most beautiful patterns. All in want of signs in the city or country, can send their orders and have the signs returned by Express or delivered at the shop on the most reasonable terms. Send in your orders for Campaign, Sabbath School or other banners, and Holden will give you the services of an accomplished artist. Mothers, Read This!--So says Dr. G. T. Taft & Co., of Seneca Falls. In their advertisement on page 20, they desire to inform you of the wonderful qualities of their "Oriental Syrup," for children. We have heard of many cases where this valuable medicine has given great relict. They are also proprietors of "Rosenberger’s Balm of Gilead Ointment," for old sores, ulcers, rheumatism, burns, chilblains, piles, &c., and for galls, or wounds on horses, it is unsurpassed. Chas. Tremain & Co., manufacturers of Rag, Book, News, Tea and Wrapping Paper, at Manlius, publish a card on page 230. Publishers and paper dealers will find them fair and honorable men to purchase from. In the manufacture of book and news, they use only domestic stock, which is conceded to be superior to imported rags. They employ experienced paper makers only, and having improved machinery, they can insure a superior article in all cases. We use their paper in the publication of our directories. Barney Brothers, General Insurance Agents, No. 8 Baldwin St., Elmira, NY, represent some of the most reliable companies in the United States. They have had great experience in the business and have been distinguished for their fair dealing and the promptness with which they have paid all losses. Farmers will find it for their interest to insure in the Farmer’s Joint Stock Co., as risks are only taken on farm property and at much lower rates than on city property. They are the original agents in this County for the Hartford Live Stock Co. No man can afford to let his stock go uninsured any more than his house or his goods. They are they only agents in the County doing Inland Marine Insurance, representing the old Corn Exchange Company. Messrs. Barney have an office nicely fitted up in a central location, and are prepared to wait upon all who may give them a call. See card, colored page 187. Lunch and Dining Restaurant, Erie Railway Depot, Elmira, NY, is a place that makes glad the heart of the traveler after a long and tedious journey. Here he may obtain a nice warm meal or a cold lunch, with tea and coffee, at any time of day or night, and only pay for what he receives. Mr. Will E. Stagg, Jr., the gentlemanly proprietor, will take you in and say " be ye warmed and fed ," and send you on your way rejoicing. Call and see. His card appears on page 234. The Watkins Express, is published by L. M. Gano, Watkins, N. Y.-This journal is so well and favorably known to the citizens of Watkins, and the whole region adjacent thereto, it seems hardly necessary to call their attention to the card on page 238. Those who wish for a live paper, one that will give them the news while it is new, will do well to subscribe for the paper. An extensive Job office is connected with the establishment, where all work will be neatly and promptly executed, in any style required. Advertisers will find it a convenient medium for setting forth the merits of their goods. Office on Washington st., west of the Second National Bank. The Schuyler County Democrat is published at Watkins, NY, by W. H. Baldwin, who has been the proprietor for about 1 ½ years. It is a seven column paper, and, under the management of the present proprietor, is increasing in all the qualities that go to make up a first-class family paper. Its circulation is steadily increasing and business men will find it a good medium for advertising. Book and Job Printing in all styles and at low rates, executed at the Democrat office. Send for the paper and have your printing done at the same office. See card, page 192. The Homestead Hotel, Elmira, NY, has been opened by C. G. Smith, and is the best specimen of an old English Inn that can be found in the country. The bedrooms are clean and provided with tasty furniture and the whitest of linen. It is a hotel adapted for country custom and people of moderate means. The dining room is large and the table furnished with the most tempting and wholesome viands. The bar-room is large and supplied with all modern conveniences. The barns and sheds are commodious and in fine order. In short there is every convenience, in doors and out, to make the place a home for the weary traveler. The proprietor, Mr. Charles G. Smith, "can keep a hotel." See card on colored page 119. George Elmendorf, Flag, Banner, House, Sign and Decorative Painter, Elmira, NY, publishes a card on colored page 120. As an artist Mr. E. has few equals in the county; his graining is unsurpassed by any that we have ever seen, and we are confident that all who will call at his rooms will be pleased with the specimens of his work there exhibited. As a decorative painter he has few superiors, and all who patronize him will secure the services of a first class artist. Elmira Lodge, No. 113, A. D. O. H.--Chartered 1862. Regular Meetings every Wednesday evening. Geo. Bein, Ex. B.; Augustus Naefe, Rec. Sec. Elmira Chapter Lodge, No. 17, A. D. O. H.--Chartered 1867. Meetings every second Sunday in each month. Philip Arnold, E. B.; Louis Schneider, Sec’y. Young Men’s Christian Association.--Howard M. Smith, Pres. ; C. C. Hall, Sec’y. ; J. J. McWilliams, Treas. ; F. G. Shurbridge, City Missionary. Chemung County Medical Society.--Dr. T. H. Squires, Pres. ; Dr. W. C. Wey, Sec’y. ; Dr. Wm. Woodward, Treas. Elmira Rolling Mill Company.--Incorporated 1860. Asher Tyler, Pres. ; H. W. Rathbun, Sec’y. and Treas. Elmira Academy of Sciences.--F. Collingwood, Pres. ; D. R. Ford, Supt. St. Peter and St. Paul Benevolent Society.--Organized 1862; John Byrne, Pres. ; James Moonan, Sec’y. ; John Shaughnessy, Treas. Mechanics’ Society.--Organized 1834. Jos. Bartholomew, Pres. ; F. A. Stowell, Sec’y. ; J. S. French, Treas. Newtown Lodge, No. 89, I. O. O. F.--A. F. Corey, N. G. Regular Meetings Monday evening of each week. Fort Hill Encampment I. O. O. F.--Ralsey Lutes, C. P.; Wm. Woodward, Sec’y. ; James McCann, Treas. SOCIALS--Organized 1868. Leman Rice, President; E. B. Billings, Treas. ; C. E. Jiles, Sec’y. EXCELSIORS--Organized 1866. S. S. Taylor, Pres. ; E. B. Billings, Treas. ; C. E. Reed, Sec’y. ALBERTS.--Organized 1866. E. S. Ranson, Pres. ; T. B. Perry, Treas. ; L. A. Hazard, Sec’y. Elmira Musical and Dramatic Association.--Organized 1868. W. F. Corey, Pres. ; J. T. Dudley, Treas. and Sec’y. Elmira Philharmonic Society.--J. B. Dunning, Pres. ; A. F. Gibson, Sec’y. Organized 1867. Elmira Academy of Medicine.--Dr. H. S. Chubbuck, Pres. ; Dr. W. C. Wey, Treas. ; Dr. E. R. Wheeler, Sec’y. The Chemung Rail Way Company.--J. T. Rathbun, Pres. ; R. S. Palmer, Sec’y and Treas. 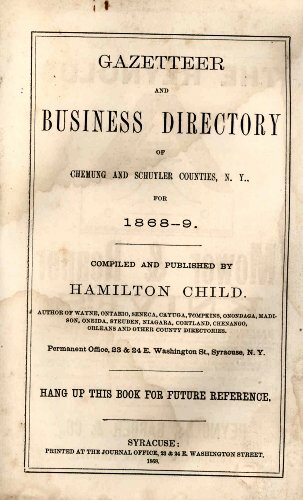 COUNTY IN CHEMUNG CO., 1868-9. TO BE HELD AT THE COURT HOUSE IN ELMIRA. CIRCUIT COURTS AND COURTS OF OYER AND TERMINER. First Monday in March -------- Boardman, Justice. First Monday in June Balcom, Justice Balcom, Justice. First Monday in October Parker, Justice Parker, Justice. COUNTY COURTS AND COURTS OF SESSIONS. The Terms of the County Court are not yet fixed. COURTS IN SCHUYLER CO., 1869-9. TO BE HELD AT THE COURT HOUSE IN WATKINS. Of the Supreme Court, Circuit Courts and Courts of Oyer and Terminer. Third Monday in April Murray, Justice Balcom, Justice. Last Monday in November Parker, Justice Boardman, Justice. Third Tuesday in June Boardman, Justice Baloom, Justice. COUNTY COURT AND COURT OF SESSIONS. Trial Term--Third Tuesday of February. Trial Term--First Tuesday of October. Special Term, with Grand Jury--Third Tuesday of August. Surrogate’s Court--On Monday and Tuesday of each week, except during the sitting of the Courts of Record in the County. Clerk of Board of Supervisors. M. D. Hawes North Hector. John D. Davis Reading Center. Henry Meisel, M. D. Elmira. M. G. Myers, M. D. Breesport. Wm. Woodward, M. D. Big Flats. C. H. Baker, Deputy. Elmira. D. W. C. Curtis Horseheads. L. F. Jackson, Deputy Sheriff Horseheads.